The Government of Andhra Pradesh aims to be amongst the top three states in the country by the year 2022 and the most developed state by the year 2029. Ensuring a happy and globally competitive society is the state’s vision and people’s happiness and well-being is being put at the forefront of the state’s efforts and gauging levels of happiness across 13 districts has been undertaken for this purpose. The international community such as the United Nations, OECD, World Bank and countries such as Bhutan have been making constructive efforts at emphasizing quality of life and happiness of people as indicators of progress and development. In 2012, UN Secretary-General Ban Ki-moon launched the UN Sustainable Development Solutions Network (SDSN) to mobilize global scientic and technological expertise to promote practical problem solving for sustainable development, including the design and implementation of the Sustainable Development Goals (SDGs). The SDSN has been conducting annual happiness assessments across countries, since 2012, published as the World Happiness Report. The World Happiness Report, 2017, ranks 155 countries by their happiness levels. India has been ranked 122 out of 155 countries, much below other countries in the region such as Pakistan (rank: 80), Bhutan (rank: 97), Nepal (rank: 99), Bangladesh (rank: 110) and Sri Lanka (rank: 120). 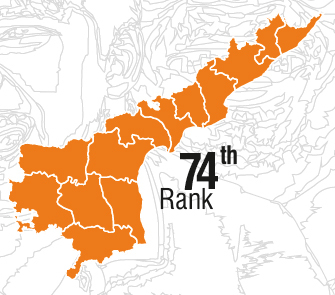 Assessing levels of happiness in Andhra Pradesh, using the same benchmarking parameters would enable the state to compare itself with the country average and other international rankings. Andhra Pradesh is a front runner in attempting to ascertain happiness levels amongst its people, using this global methodology.